It is a full time job keeping up with the shenanigans of my husband Luciano and my in-laws next door, Anna Maria and Giancarlo. Check here for monthly stories, photos, recipes for seasonal foods, updates on my writing and all the dish on the inhabitants of our little corner of Italy. “Well, yes, that is true! I would have brought him in to prove it, but he had to go to work!” I assured the woman that there was no fraud going on here. Luciano and I in fact had stood right here in this office seven years ago insisting on our right to obtain a marriage certificate. In fact this may have been the very woman who told me incredibly that I needed to get my sworn affidavit freshly obtained from and verified by the US Ambassador in Milan corroborated by officials in Treviso. But I am not sure…I was a little emotional at the time. But I imagine that there are a lot of comings and goings in the Mareno di Piave City Hall. And being a crew member of such a tightly run ship, she just wanted to be precise. “OK. Well, take these documents home and think it over. You now have six months to decide if you truly want to become an Italian citizen. If you change your mind, the request will just disappear after six months.” She sat back behind her clean desk, the wide and empty expanse dwarfing her. “No, I am pretty sure I am ready.” After all, I worked very hard to get to this point. In fact it had taken tedious communication with officials in Louisiana, California, Washington DC, Rome, Treviso, and Milan in order to establish my birth and status as a law abiding citizen, countless fees to a myriad of offices and almost three years of waiting. As if I might suddenly change my mind? “Oh!” Suddenly it all was more real. I felt a tug of loyalty to America, my riotously beautiful and conflicted country…but I had come this far. And it wasn’t as if I were giving up my US citizenship. “Should I make the appointment now?” I hadn’t just shown up at this party; I know how slowly the wheels can turn here in Italy~ to get an appointment with an official within six months’ time is not easy. Perfect. I had approval papers, an Italian husband, proof of one last fee payment, and time to plan the event. Now the only thing between me and dual citizenship was a flag…an Italian flag. I have seen all the movies. One needs to show up at a citizenship ceremony with a flag, right? I even asked the woman at City Hall…she paused, thinking and said, “The only one we have is for the front of the building….” Her voice trailed off. Finally Luciano said quietly, “If I had only six months to do something this important, I would have done it right away.” As usual, when Luciano speaks softly, the power of his words is shattering. With or without a flag, I went directly to City Hall and booked an appointment: Tuesday. January 22. That very afternoon I stopped in the toy store in Mareno right down the street, where Giancarlo had suggested checking, and asked for an Italian flag. The clerk went directly to the corner of the store and placed one in front of me. The quest was over. I finally had a little plastic flag whose colors represent hope (green), faith (white), and charity (red). Or green for the hills, white for the mountains, and red for the bloody wars. It depends on who you talk to, what side of the Piave you are from, or what dialect you speak, etc. In other words, a perfect representation of this kaleidoscope of a country I was preparing to join. While the words are soaking in history, melodrama and violence, normal elements of all anthems, the melody is rousing and inspires standing up a bit straighter and swinging a fist. I practiced singing it out the window one afternoon with Anna Maria standing below to help me. I swung my fist. “Me too,” she muttered. I did not take it personally. “But I have not memorized this!” I was distraught…a last minute hiccup? As I read the words, I unexpectedly felt my throat tighten and tears sting my eyes. Italy has changed my life in so many ways, had saved me, and now it felt as if I was finally honoring that debt. How wonderful. My Italian family leaned over my shoulder and read the words. “And anyway, you can just read it,” Antonella assured me. “Giuro di essere fedele alla Repubblica Italiana, e di osservare la Costituzione e le Leggi dello Stato.” The paper trembled just a little, but my voice was strong. “Ok, congratulations! You are now Italian.” He shook my hand. “That’s it?” said Giancarlo. I could hear the smile in his voice over my shoulder…I think he was expecting me to sing. Being in the office only two nights a week, the mayor must have a lot on his plate so we were hustled down the stairs and out the door and four Italians stepped out into the frigid January night. “Are you still in your hobo phase? Luciano wanted to know what to do with his redeemable coke bottle and if I was still on my mini boycott. As usual, when I carry out my demonstrations, no one really notices. I once protested my gardening limitations at home by not planting anything in the corner garden for a year and all I got was compliments on how tidy the space was. Bucking the system here in Berkeley was just too hard. If I left those bottles in the recycling, we were subject to late night foragers who were essentially stealing, not to mention waking me up. If I wanted to be sure that the money went to the city, I had to make a trip down to the miserable recycling center, spending more money and time than the whole exasperating event was worth. And it was painfully clear that I would never get any refund. Discouraged by the whole urban thing I shook my head at Luciano. “Ok.” Without a care in the world, he walked out the door and I heard a solitary clink as he tossed away his right to five cents and headed off on one of his afternoon walkabouts. 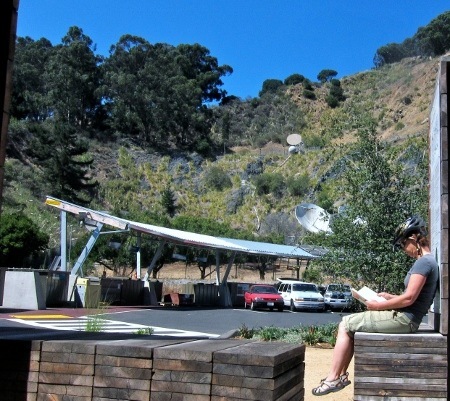 At the top of steep Marin Avenue I paused for breath with hands on hips. Panting, I gazed around me but this time unlike before, I turned my gaze a full circle. In front of the house at the corner was a small wooden box on a pole. 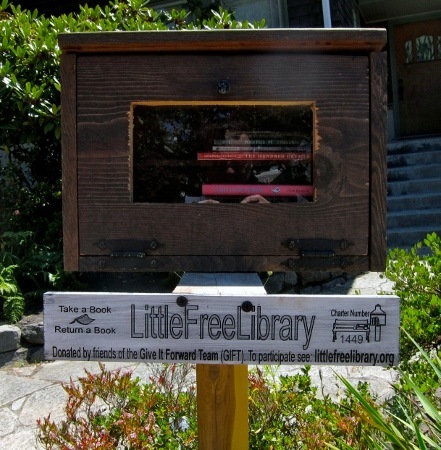 It had a pitched roof and a sign on the little wooden door: Little Free Library. The sign above the door encouraged passersby to take a book, leave a book, and to read. A notebook was tucked into the box, a sort of check-out system, and I flipped though it reading comments from grateful readers. How nice. I made a selection and with a book tucked under my arm continued my run. Not an easy thing to do, but I couldn’t resist what I found: a beautiful copy of The Hundred Dresses by Eleanor Estes; book that pulled from my childhood, something I had read…..
Berkeley glowed under the crisp afternoon sun as I trotted along the crest of the hills, through a tree lined path between the funky houses and down crooked stairs that dropped onto a street that used to be part of the famous Key Route streetcar system. At the base of the stairs, pushed under a tree, was a box of children’s toys, primary colored bits of plastic, looking for a new home. Later I sat with a cold beer on a park bench, nicely warm in the waning sunshine and read The Hundred Dresses. A little girl passed by, then paused, turned around and came back to me. “That is a great book.” She whispered. Three days later found me cruising around on my bike. With no particular destination I swung up random streets, trying to make some kind of circular progress while avoiding the steepest hills, both up and down. Having crossed over into El Cerrito this is not an easy thing to do…after all the name of the town means little hill, a legacy of the Spaniards who wrestled the land from the original Ohlone Indians. As I took a curve I saw a sign out of the corner of my eye: Recycling Center. Hah! Maybe I can get outsmart everyone up here in the quiet El Cerrito hills…which is a bit redundant, actually. The gears on my bike quietly whirred at the top of the hill as I coasted into the parking lot of the El Cerrito Recycling center, which I am here to tell you is a magical place. Unlike its grubby counterpart on the other side of town, the air blew fresh across the clean and open center where cars could pull up to numerous well marked bins: batteries, paper, plastic, anything with a plug. A man sat in the back of an enormous Goodwill truck, reading a book in quiet solitude while waiting to intercept items for the store that might otherwise end up in a landfill. A man pulled up to the paper bin and slid a load of flattened cardboard out of his life. He stopped by the Goodwill truck and handed over a small pink bike. Even the garbage was prettier in El Cerrito. How logical. How peaceful. Were it not already idyllic, I could imagine soft new age music playing in the back ground…maybe some wind chimes? But it got better. 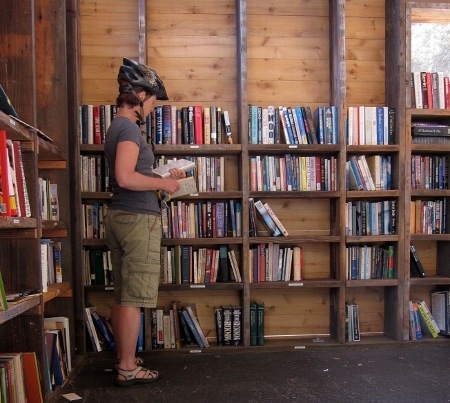 I locked my bike, so not to have it confused as a donation, and wandered over to a covered section where I stumbled upon the greatest discovery of the summer: The El Cerrito Recycling Center Library. At this gracious and dignified end of the road for most of the material items in this small town, someone had built bookshelves, a roof and even nice benches for relaxing with a book…at a dump. Not only that, an impressive effort had been made to pull donated books from the bins and place them on the shelves in some sort of organization. Cookbooks, language, novels, travel. I stood in delighted confusion. A gentle breeze cooled my neck. A woman was browsing nearby. “How does this work?” I asked. She had no idea how much I could jam in that little backpack. I loaded up on a few novels, a few grammar texts, a copy of Writing Down the Bones by Nathalie Goldberg (one can never have too many copies of that) and a copy of Sense and Sensibility for my student Elena who is passionate about Jane Austin. Who could imagine that Jane Austin would go into a dumpster in Northern California, be fished out and placed on the shelf of a makeshift library and then make its way across the ocean into the hands of a young Italian woman who met a German boy over the summer and now finds a new urgency in learning English? I sighed happily as I climbed onto my bike. It all makes sense. Berkeley gives and takes. Scavengers can rummage through my bottles and the city can have my five cents. All I need to do is wait and wander. Whatever I think I have given up is sure to come back to me in one form or another. It is four o’clock in the morning and outside our window the disturbing clink of bottles rattles me out of sleep. In the silence of the soft Berkeley dawn, the noise is shocking and I rocket from deep sleep to violent outrage in an instant. Who has this right to burrow through our recycling while I am sleeping? Leaping like a shot out of bed I ran from window to window in the dark room, trying to see the object of my wrath, but my view was blocked by the thick trees. How could I direct this anger into thin air? I needed to see my target. Clink! Clink! Clink! Then out of the corner of my eye I saw Luciano out on the street, tall, solitary and suddenly vulnerable, walking towards the noise. The man was about to confront people going through discarded bottles at four in the morning outside of a private home. This just wouldn’t happen in Italy; another situation he would never find himself in at home. He could see what I couldn’t, but composure oozed from his finger tips. Luciano glanced up at me and then back to the scavengers. I did not see it but perhaps he gave them an eye roll towards me; Guys, you see what I have to put up with? Gimme a break. Out loud he said, “Can you at least move to the next bin? “Sure.” And they did. Now it was someone else’s problem. I sank into the bed and sleep as Luciano padded back into the house as quietly as he had left it. As always, elegant yet effective. I know they were looking in particular for the bottles that can be returned for a 5cent deposit. While individually not a big payback, when you put together a shopping cart full of plastic soda bottles and glass beer bottles, it could represent lunch. But for the city of Berkeley that money provides a much needed subsidy to the recycling program. And wait a minute! What about me? I pay an extra five cents plus tax for each bottle. Where does that money go? I instituted a new no-recycle rule in the house and instructed Luciano to only toss the non-revenue bottles into the recycling bin. This he did, but then lined the others up in the hallway, perhaps to annoy me, and as the line of nickel bottles grew I researched options for keeping those scavengers out of our bins. 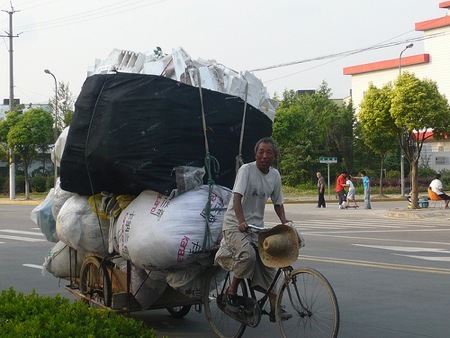 I traveled up to the supermarket to ask how I could get my refund for responsible recycling. I remember there being a counter…. The cashier hesitated, most likely wondering why I just didn’t throw it in the bin behind the house. Ok, she did not say the last part, but I got the gist. Resolved to carry through with my principals, I headed down to the Berkeley Recycling Center with my five large plastic bottles and seven beer bottles. Those street foragers weren’t going to outsmart me or the City. No way. Forklifts were buzzing past me. There was the splintering crash of thousands of bottles being poured from one container to another. Cars screamed by on 580 as I walked across the yard, with my feet sticking slightly to the pavement, to get in line. I stood for a moment, absorbing the unfamiliar surroundings when I noticed that I was standing behind a man with a shopping cart heaped with bottles. In front of him, extending four or five deep, were men and women with flatbed carts heaving with collected containers. Everyone was anonymous, grey and staring at me with my little bag of 11 items. Then I realized I was standing in line with people who do this for a living and it was entirely possible that I was standing behind the very people at whom I was screaming from my window. I felt suddenly out of place, very suburban, and a little bit stupid. I turned and walked back to the hoodie guy who seemed to be waiting for me to return. Grinning he pointed at the bins lined up against the barbed wire fence. I hitched up my dignity, strolled across the filthy yard and hook shot my bottles into the appropriate containers. There, I sure taught them a lesson. I held up the macaroon in the palm of my hand. 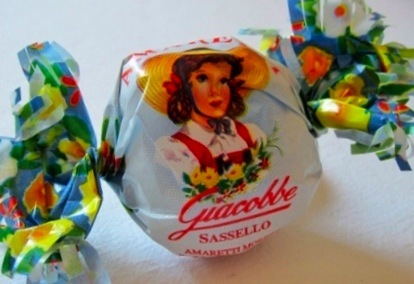 The handmade almond confection was wrapped in a gaily decorated paper, the edges tasseled like a party favor. I felt as if I blew on one end, it would unfurl with a snap and toot. This box of soft macaroons was a gift from my friend Carlo who, with his wife, had visited the town in Liguria where they have been made, one at a time since 1955. “Here, try one.” With all the solemnity of transferring a jewel, I handed one to Luciano, who tore into the wrapping and swallowed it whole. It took all of two seconds. I didn’t even have time to reclose the box. But then, he is not a sipper. Making a mental note on how fast that thing had disappeared, I hid the box. Luciano would never eat something of mine without asking, but why tempt the man? And I want to keep at least one of these happy things around for a while. I then went back to scrubbing the grill from last night’s dinner which, a moment ago had been a bit of drudgery, but now just wasn’t so bad. How many moments of pure happiness are there in a day? As Topo, my little blue car, and I motor around the Veneto with my classroom in the trunk I see many things; snapshots of life, a simple moment of bliss. I started collecting them in a file called snapshots but have not been able to link them until I held that frivolous, excessively wrapped sweet in my hand. A circus from Eastern Europe passes through nearby Susegana every year, setting up a battered tent and staking the camels out in the scruffy cornfield near the industrial park. Jaded elephants, the heavy leg chains having become indistinguishable from their thick skin, sway in the shade of the big top while nearby shoppers flow into the local big box store looking for flat screen TV’s or cook pots. It is such an incongruous sight that I always slow down as I pass…and it was there that I saw a moment of happiness. Between the shabby circus trailers set up on the edges of the encampment, I saw a man sitting in a red chair in the rough grass. His ruddy face was turned to some friends sitting at a nearby picnic table. They were laughing. Standing behind the smiling roustabout was another man, with muscular arms raised, studiously cutting his friend’s thick black hair. Not ten minutes later I passed a white house that gleamed in a sudden show of early spring sunshine. 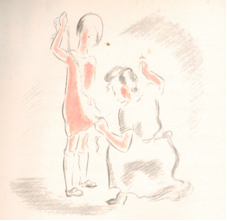 In the garden in front of the house a small girl was pushing a wooden swing with all her might. Leaning back on the swing, a woman in a blue apron had her hands on the chains and her feet in the air. Her head was back and her eyes were closed with her face in the sun, taking a break from morning chores to travel through space and time to the moment she was a child pushing the swing with all her might. 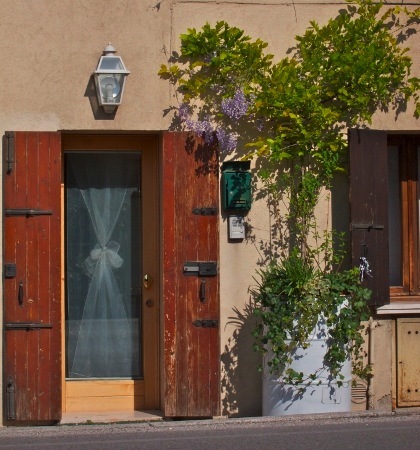 A whitewashed 50 gallon drum sits against an ancient house built on a once narrow dirt lane; the only thing separating the front door from speeding cars is a painted stripe on the pavement. Someone has planted a wisteria tree in that banged-up drum and now it blooms, blissfully beautiful against the worn stucco. A nonna walks down our street in her housewife dress and apron. She seems to have just stepped out of the kitchen for a moment for in her hand is a cook pot. As I pass she stoops to gather the tender wild greens that grow everywhere in this season and throws the handful into the pot. Lunch. The gas station on the road to Treviso has a handwritten sign out front. Menu di Asparagi. The gas station. A vigorous orange gerbera daisy grows in a chipped coffee cup set on a stump. And last Saturday afternoon I heard bells outside the window… I know that sound anywhere: ice cream truck. In my mind I am suddenly a child, running wild with my brothers and sisters in the back yard with summer hardened bare feet, stained purple with fallen mulberries. The bells ring at mid-morning and all play stops as we run screaming to the street, “Good Humor Man! Good Humor Man!” We balance on tiptoe on the hot asphalt street, choosing a popsicle from the gay illustrations on the side of the truck and then pay with the wadded up bill that my mother had stuck into someone’s pocket, just in case. As the driver shifts into drive, turns on his bells and motors on, we stand in a circle on the grass and eat; the younger ones, not always able to keep up with the heat, lose some of the ice cream in melted streaks down their bare brown tummies, but it doesn’t matter. They are hosed off easily enough. 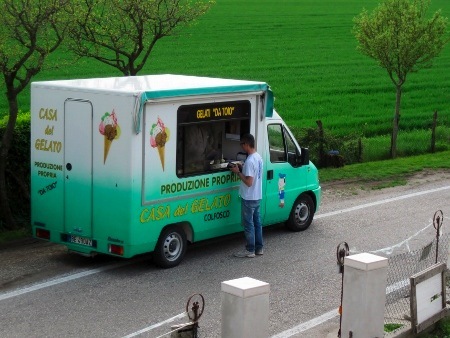 In Mareno di Piave I leaned out the window and saw the ice cream man dishing up a scoop for our neighbor. No prepackaged ice cream here. Now as I tell Luciano about my memory, the name “good humor man” just rolls off my tongue and he laughs at me. In fact, I realize that for us it was a state of mind, not a brand name. How could it not be? Here in our quiet hot afternoon and in an official white coat, the vendor bent over the buckets of homemade, produzione propria, ice cream. Then he shifted his truck into drive, turned on his bells and motored on… the happiest noise ever. “I can get a better phone any time I want…I could get one tomorrow. Well, I could on Tuesday, the stores are closed tomorrow, but I could do it!” With that Anna Maria stormed out of the room, or at least stormed as much as I have ever seen. “Is she angry?” I asked Luciano who was laughing. I could tell she was agitated since she had switched to dialect, something she does unconsciously when excited. After all, Italian is as much a second language for her as it is for me and so she needs to concentrate to speak it. And while I can get the gist of the conversation in dialect, the details escape me. Zio Danilo was laughing too. He’d had the honor of pushing his sister just a bit too far, suggesting that her mobile phone was outdated. After all, it had no loudspeaker function and certainly could not take photos. He whipped out his fancy sliding phone, 3 megapixels, and took a few calls…I think to show off. 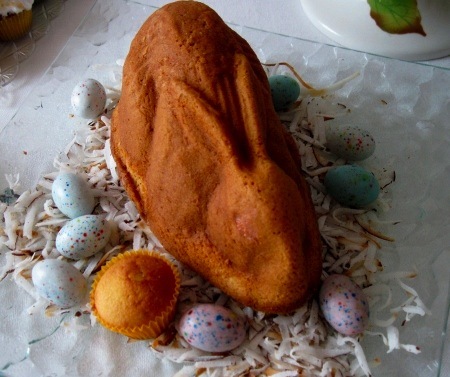 But in fact, being Easter Sunday, Luciano’s Uncle Dan was in high demand. He had just finished leading the mass over in San Polo, but the much-loved priest in town for the weekend is constantly fielding invitations. I think we were pretty lucky to score his presence for Easter lunch. It did not stop Anna Maria, however from being peeved at his comments on her technological limitations. These criticisms were pretty strong coming from a man who did not own a cell phone until two or three years ago. People used to track him down by calling house phones from San Polo to Mareno…sometimes even during lunch, the epitome of poor education. Anna Maria had rejoined us, sitting at the table glaring at her brother as Giancarlo made the coffee. Zio Danilo hung up and gazed at his younger sister. That was a tense moment. “How many megapixels do you have on your camera, Anna Maria?” I asked innocently enough, as if to change the subject. Anna Maria brightened. “Yes.” She was happy. Everyone relaxed. Indeed she had been the family photographer last summer when I left my old camera with her to record the progress on the house next door; a job she took very seriously. Now of course, Anna Maria was incapable of operating her hand-me-down camera without my going through the steps every time she wants to take a picture. And I am convinced she does not know what a megapixel is, but that did not matter, nor was I going to mention that fact. For the moment she has won the technology spitting match between siblings whose childhood had been spent in a house with a cow in the front yard and no electricity. Appeased, Anna Maria turned and pulled a piece of paper out of her drawer. This usually means that she has written down some English word that she heard or read and wanted to try her pronunciation out on me…to see if I can figure out what she is saying. I have heard leepstic, (lipstick) ies ui chen (Yes, we can) and hot pants (that one I got). I usually can guess, but sometimes she catches me off guard. “Well, that is not really simulation, is it?” Luciano commented dryly. Anna Maria shot him a look and again switched to dialect. I missed the details, but it was my impression that she clarified this particular method of torture, her expertise on the topic in fact, alarming. I assured her that I knew what it meant. Giancarlo poured the coffee and Zio Danilo stirred in his three spoons of sugar. “Oh I know that, it is a system of book exchange!” Of course Luciano, sworn lover of books, knew this word. “Serena does not know it because books are being replaced by digital versions,” Zio Danilo had succeeded in getting the conversation back to technology. 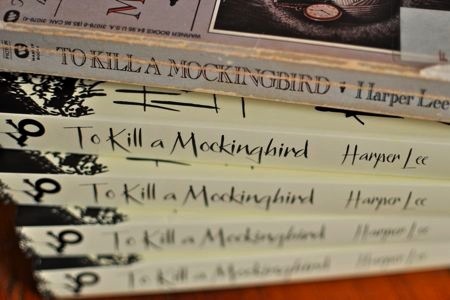 “In fact, they are talking about replacing all the books in the library with a digital format of some kind. Anna Maria said nothing…probably digesting this alarming step into the latest brave new world that she had no hope of pretending to understand. “Oh, Call of the Wild. That’s not an easy book.” I was impressed, but not really surprised. 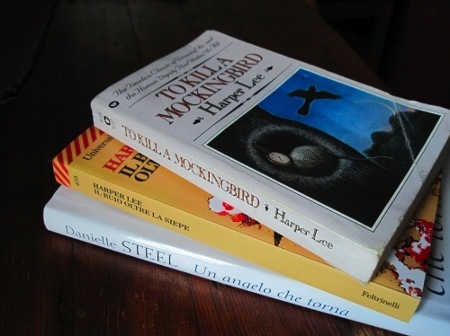 The Italian school system for some reason has not gotten beyond 19th century literature and most people I have met have read Oscar Wilde, Emily Bronte and Jack London, but know nothing of John Steinbeck, Ernest Hemingway, William Faulkner; T.S. Eliot, David Foster Wallace…or Danielle Steel, for that matter. “Have you read Call of the Wild, Anna Maria?” One more jab from Uncle Dan? “If they don’t, someone should burn it down.” Luciano has strong feelings about the classics. Her brother knows this and, being the peaceable, albeit mischievous, priest, he sat back and smiled across the table. The rain came down in sheets outside and the blossom laden trees across the street danced in the blustery wind…strange weather for Easter. But harmony reigned once again at the kitchen table, whose smooth surface shone with years of elbows, book covers and warm banter…in any language.